Each time I place my dairy order, the delivery always comes as a delightful surprise as I never remember exactly what I had ordered. This week I placed my largest order ever. 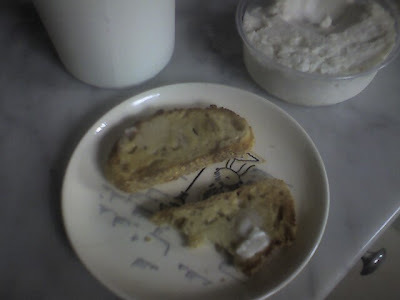 I received a delivery which included some new items like goat butter, goat yogurt and most notably, cup cheese. I was inspired to order this when I heard that it was made with cheese curds like those used in cottage cheese. The curds are dried and then baking soda, cream, butter and milk are added. The whole mixture is stirring until it is exceptionally smooth. It is a traditional Pennsylvania Dutch food and I learned more about it here. Meanwhile I have been musing over using it to make an exceptionally creamy macaroni and cheese...Stay tuned.